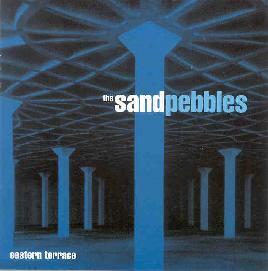 The Sand Pebbles - "Eastern Terrace"
Most of the stuff on the Camera Obscura label is pretty interesting and this is no exception. This Australian band plays some pop music that is quite strange and not that mainstream sounding, mainly due to the fuzzed out instruments and out of phase sounds. The Julian Cope cover, "Out of my mind on Dope and Speed" is the highlight of the CD for me. I really love this version. The more commercial oriented songs, "My Sensation" and "Dirty" could be hits but again, perhaps a little too strange. Glad to see someone doing this! "One Time at Sundown" was a cool short 2 minute instrumental piece that I really liked. "The Sundowner" is a long, nearly 9 minute track with some cool organ and spaced out sounds accompanying the slow driving sound. Interesting stuff. A few of the tracks remind me of their labelmates, Abunai! A very enjoyable musical experience.